cf. ER2 post below for guidance. 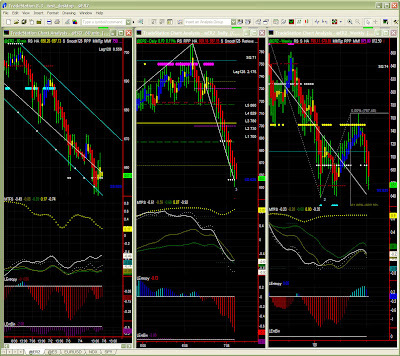 MM/Fib levels are obviously symbol specific. Position (60mins): short, looking at a possible exit point. Options (RUT): 625 or lower for July puts (625 is very likely to hold). Yesterday's post on SPY proved correct again, with some support on stall level. This fall has really been a trading bonanza for over a month. On ER2, last post was also correct ("lower, lower...", and... not sure we've seen the end of it just yet... This post will therefore very much look like the previous one until we clearly see a clearer target. Same recommendation as last time. We will use a lower TF (15mins) to probably check for a possible target (nothing wrong with taking profits) or "play the channel" bounces and/or breakouts. ER2 shed over 100points in a few weeks, and we would like to see a target, so where is it? It could be around 640 where prices bounced earlier this year, but again we would have to see Entropy bottoming up and MTFS line gradients flattening near oversold zone. It will take at the very least a few days, but having said that, the fall may slow down or even enter a congestion period near lows. No major change from last post. As mentioned previously, we are now seeing the development of a down Fib pattern aiming straight at MM support level (~625). 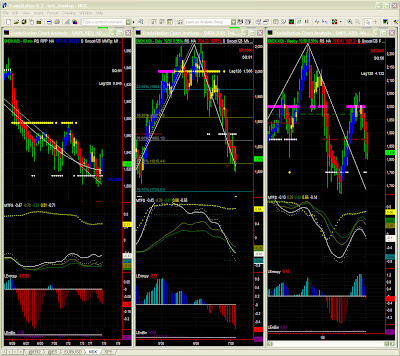 Since the MTFS pattern is not so bearish, the Fib pattern can still fail. 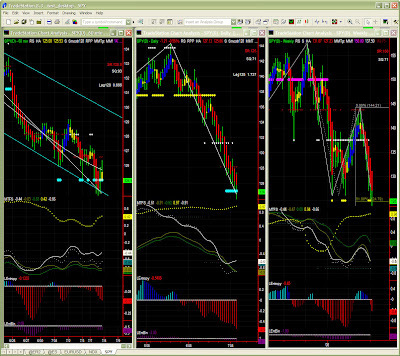 We will therefore also look for a possible support level along the way i.e. somewhere between current stall level (656) and strong support level (625).